Pelenna Patchworks: Moda Coquette bundles and new bag patterns in stock! Moda Coquette bundles and new bag patterns in stock! After a refreshing holiday, we're back and uploading new products! 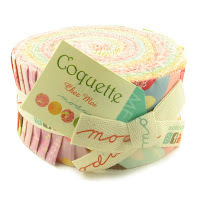 Brand new in this week we have the latest Moda jelly roll and layer cake, Coquette by Chez Moi. Flirty and all frills, Coquette's watercolor florals are awash with frou frou femininity. Fanciful, pretty posies with lacey accents are delightfully dainty and cheery, like a bouquet of sunshine! In a fresh picked palette of petal pinks and lavenders, leafy greens, aqua skies and sunny soft yellows the latest from Chez Moi is simply sweet. Also added this week are 4 new bag patterns by Lazy Girl Designs to our range - Margo, Candice, Claire and Summer Tote - why not try one as a small, quick project that will leave you with a stylish, useful bag?